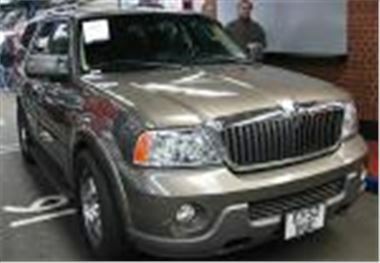 Well, when did you ever see a Lincoln Navigator at a UK car auction? The moto in the photo was a 26k mile 52 reg 5.4 VLT with everything including 7 leather seats, TV and satnav, imported in August 2004. Top bid was a provisional £24,100. The 12k mile 04 reg Bentley Continental GT Coupe featured in the pre-auction report was also fully loaded and bid to £92,000 provisional. Interestingly there was another in the carpark with ‘For Sale’ stickers in its windows, just like a £400 Astra parked on a grass verge near the local chip shop. Hardly the way to merchandise a Bentley, old chap. The Navigator and the Bentley were trader’s cars, looking for an opportunity. The Black Horse cars were entered by a finance house looking to get its money back. The two Aston Martin Vanquishes in this part of the sale were both sold, so you can take it as read that the prices they fetched were what the trade was prepared to pay. The 14k mile 02 Vanquish sold for £89,500, and the 2,915 mile 04 reg car sold for £109,000. Also in the Black Horse section, an alloy bodied 37k mile 2003/53 reg Jaguar XJR 4.2, which lists at £61,000 new, sold at £30,100, just under half price. A 5k mile Belgian imported RHD 04 reg Mercedes CLK 320 Elegance convertible made better money at £35,900. A 45k mile 99T Porsche 911 996 3.6 Carrera 4 convertible sold just below book at £31,250. And a 28k mile 2001X Mercedes SLK 320 6-speed manual (the one that drives like a sports car) sold for a surprisingly low £13,400. A pair of Works MINI Cooper Ss came up among the Porsche part-exchanges. The rather gaudy 7k mile O4 reg red one bid to a provisional £15,900 and the much more tasteful grey and white 6k mile 04/53 reg sold for £15,300. A new shape 19k mile o3 reg Audi A8 4.2 quattro sold for £32,600, a 6k mile 2004/54 reg BMW M3 3.2 SMG coupe sold for £35,900 and, back in the Top Car section, a 29k mile 2003/52 reg BMW X5 3.0d Sport auto in black with all the right bits sold for £34,500. The 11k mile 2003/53 Mercedes CLK 55AMG in the pre-sale list bid to a high provisional £63,000. And the quite high spec 16k mile 04 reg SL350 we’d seen before sold for £49,500. Leaseplan will be offering no less than eight green and white 51 reg MINI Coopers in its 16th February sale at Blackbushe. There’s a Classic Car auction on Monday 21st. And Top Car again on Monday 28th. As always the best way to look for a specific car coming up at auction or to pre-check a day’s sale is to visit www.auctionview.co.uk This service also now gives composite price information (average auction price, CAP and Glass’s) and now allows you to buy a selection of cars directly on-line.